Psettodes erumei, as depicted by Sir Francis Day. I had two things I could have written about this morning, both of them very cool. There's the identification of possible chloroplast-derived genes in ciliates, for one. This is very neat, because ciliates belong to a group of protozoans called alveolates that also includes dinoflagellates. Dinoflagellates have red-alga-derived chloroplasts that contain chlorophyll c, a form of chlorophyll otherwise only found in chromists, the group of algae that includes brown algae and their unicellular relatives. On this basis, it has been suggested that chromists and alveolates together form a superclade called chromalveolates (as opposed, I suppose, to alveomists). See the post I wrote earlier about the discovery of the rather significant little alga Chromera velia for more details. Ciliates have been something of a fly in the ointment for this theory, as they contain nary a trace of a chloroplast, which might support the alternative idea that dinoflagellate and chromist chloroplasts are independently derived. Monophyly of chromalveolates would require that ciliates are derived from chloroplast-carrying ancestors that lost their ability to photosynthesise, something that chloroplast-derived genes in ciliates would make more credible. The other option to write on was the identification of stem-flatfish. I was leaning towards ciliates, because the stem-flatfish story has already been covered by Ed Yong, GrrlScientist and Carl Zimmer, but I can't access the ciliate paper. So I guess that flatfish it is. Flatfish are the group that includes such creatures as flounders, sole and halibut. Fish are, of course, the animals that invented ugly. With contenders such as gulper eels, sculpins and dories in action, the title of World's Ugliest Fish is hotly contended. While flatfish are far from being the winners at ugly (that position is quite firmly held by the anglers), they definitely deserve an Honourable Mention. Flatfish larval development, from Pharyngula. At some point in their history, both eyes of the ancestral flatfish moved onto the one side of their head. The eyeless side of the body is used by the fish to lie flat on the substrate (hence the name), so left and right have effectively become upper and lower (in most species, right is upper and left is lower, but there are some exceptions). The really odd thing is that flatfish actually hatch out as fairly normal-looking larvae, with the eyes in their usual places on either side of the body, and over the course of maturation one of the eyes migrates over the top of the animal to the other side. How this state of affairs came into being has been a difficult question, and Goldschmidt actually gave flatfish a significant role in his arguments for saltatory evolution (evolution happening by a series of rapid jumps), a theory that has been parodied as the "hopeful monster" position. A paper in today's Nature (Friedman, 2008) adds some crucial data to the debate, as well as confirming that the change took place gradually. Friedman (2008) establishes that the fossil fish genera Amphistium and Heteronectes show distinctly asymmetrical eye positions on the skull. While the eyes are still on separate sides of the head, one eye is positioned distinctly higher than the other. That these were fully developed adult fish rather than larvae with eyes in the process of moving is indicated by the complete ossification of the skull. Phylogenetic analysis supports the position of the two genera as fossil outgroups to living flatfishes, lying along the stem. This position is supported by characters other than those related to the asymmetry of the skull, so is unlikely to represent convergence. Because the specimens lack distortion in other elements of the skull, Friedman was also able to conclude that the asymmetry was not the effect of post-mortem distortion. 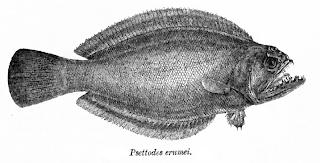 The idea of a gradual development of flatfish asymmetry actually already had support from the living genus Psettodes, generally agreed to the sister taxon to other living flatfish. In Psettodes, the migrating eye moves to the other side, but only as far as just below the dorsal edge. It is also notable that Psettodes apparently spends more time swimming upright than other flatfish. While most flatfish species show a distinct developmental preference for which side the eye migrates to, with opposite-sided individuals as relatively rare mutations, Psettodes individuals may experience eye movement to either side during development. Interestingly, a study by Schreiber, 2006, on larval development in southern flounder (Paralichthys lethostigma) found that while all wild-caught specimens were left-sided, 16% of larvae in the lab developed right-handedly, while 4% of larvae actually developed bilaterally symmetrically, with either the eyes remaining where they were or both moving dorsally. It seems likely that the failure to find such variants in the wild indicates that for some reason or other they do not generally live to adulthood. Of course, the identification of these asymmetrical ancestral forms still leaves a lot of questions open. What we still don't know, of course, is why the ancestors of flatfish started lying on their sides, and why they became asymmetrical. The asymmetrical-but-not-one-sided forms Amphistium and Heteronectes are known from two stages of the Eocene, and were contemporary with more derived crown flatfishes, so they were not a short-lived maladaptive form that shuffled off as soon as their better-adapted descendants arrived. It has been suggested that the flattened habitus of flatfishes allows them to better conceal themselves while waiting for other fish as prey, which they are then able to ambush from below, and Amphistium, like living flatfish, does appear to be piscivorous. Side-resting fish may have been subject to selective pressure for eye asymmetry that allowed them to keep an eye out for prey while remaining concealed, and Friedman suggests (in comparison with modern flatfish behaviour) that Amphistium and Heteronectes may have been able to prop themselves up on their pectoral fins, raising the lower eye above the substrate and allowing them to 'squint' for prey. At the moment, of course, this is all speculative. From the aforementioned developmental studies (Schreiber, 2006), though, we can add some details. As well as having the eyes move sides, the larvae also change from swimming vertically to swimming laterally, but the two are independent events. Change in swimming orientation occurs before eye migration, and that small percentage of larvae that did not experience eye migration still changed swimming orientation. In a very small fraction of larvae, swimming orientation actually developed in the opposite direction to eye migration, so they ended up swimming with the eyes on the underside (needless to say, these unfortunate individuals did not live long). Further investigation of how asymmetry develops in living flatfishes - particularly the basal Psettodes - may shed further light on how this remarkable condition arose in the first place. Friedman, M. 2008. The evolutionary origin of flatfish asymmetry. Nature 454: 209-212. Schreiber, A. M. 2006. Asymmetric craniofacial remodeling and lateralized behavior in larval flatfish. Journal of Experimental Biology 209: 610-621.